Have you ever had that experience as adult where you watch a movie that you were obsessed with as a child and you realize that you've based your own personality from a character in that movie? 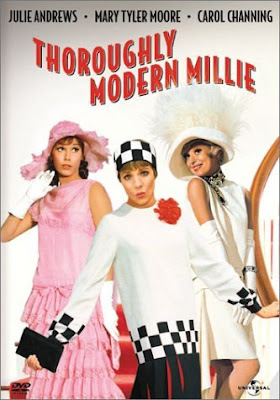 Last night Chup and I purchased and watched Thoroughly Modern Millie--a musical I can stomach. I was first introduced to this classic by my friend Katy when I was ten or so. I would insist on renting it frequently until I hit my teens. A few years passed without viewing. Then, one Christmas I remembered how much I enjoyed this rousing musical and I asked Santa it to me in my stocking. As the story goes, Santa brought Stephanie the movie by mistake (which is what occasionally happens when you live in a gargantuan family.) Stephanie refused to see the error of Santa's ways and cashed in on my misfortune by keeping the movie to herself. She did allow Topher and I to view it per her graciousness. Thus, Topher and I delighted in Carol Channing's Muzzy and her random declaration of the word "RASPBERRY!" one last time. Watching Muzzy in all her glory for the first time in a while last night made me realize the effect she had on me in my youth. She made me the performer I am today. Muzzy is a once-jazz-baby-turned-wealthy-widow with time and money to spend at her leisure. She takes flying, singing, boxing, Spanish lasso and acrobat lessons. She dances spasmatically. She flirts with abandon. Amazing clothes. Terrific show-off. And she's blond. Blond with diamonds. Yes, a Muzzy life for me. I think that is all I wanted to say about that. I guess if you know Muzzy and you know my stage presence, you'd understand. I better receive an e-mail from Topher today saying "I know just what you are talking about . . ." And then another one from Stephanie saying "I am sorry I stole your movie that one Christmas. . ."